COMMENTS: normal series from 1993 to 2011. Plate style from 2004 to 2011. 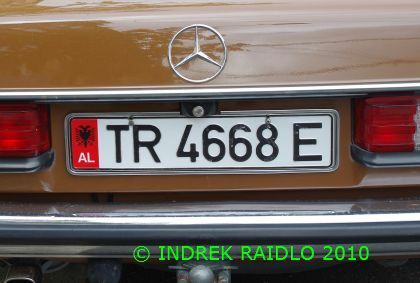 TR = Tirana. COMMENTS: normal series from 1993 to 2011. 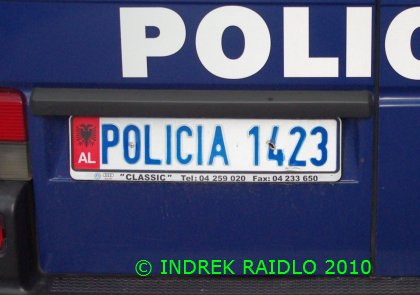 Plate style from 1995 to 2004. 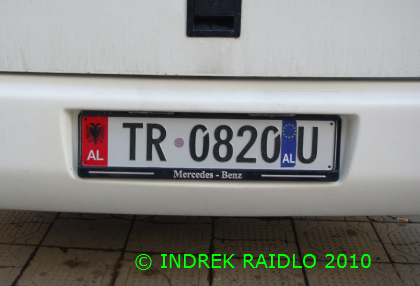 TR = Tirana. COMMENTS: normal series from 1993 to 2011. Plate style from 2004 to 2011. 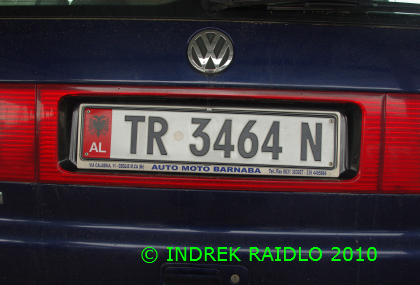 TR = Tirana. Some drivers use unofficial Euroband. Usually before suffix. COMMENTS: taxi series from 2001 to 2009. Plate style from 2004 to 2009. 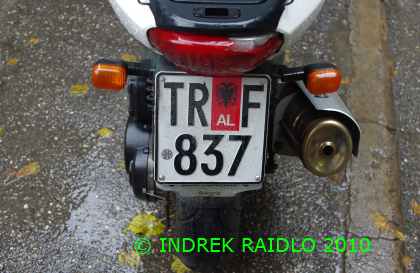 TR = Tirana. COMMENTS: motorcycle series from 2001 to 2011. Plate style from 2004 to 2011. 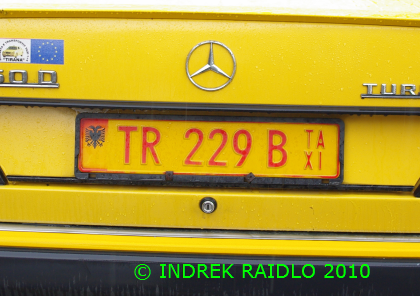 TR=Tirana. COMMENTS: moped series until 2011. 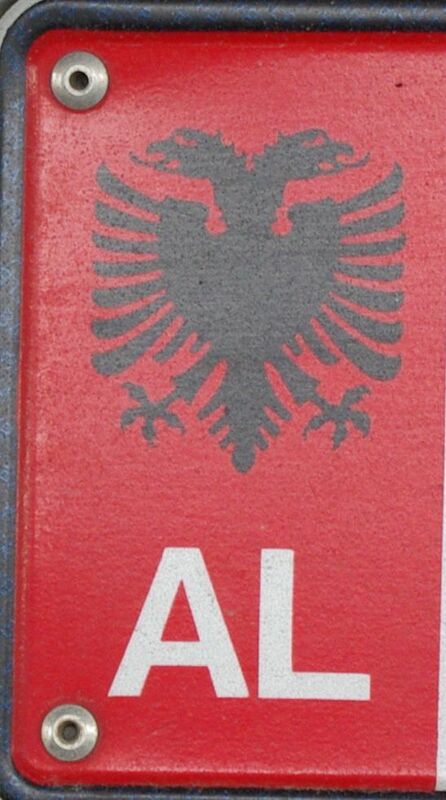 TR=Tirana. COMMENTS: diplomatic series since 2011. Plate style since 2011. 23=U.S.A. COMMENTS: diplomatic series from 1995 to 2011. 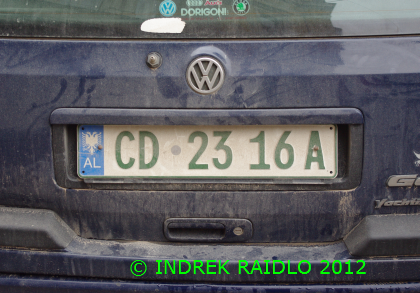 Three numerals after embassy code used from 2007 to 2011. Plate style from 2004 to 2011. 12=Iran. COMMENTS: diplomatic series from 1995 to 2011. 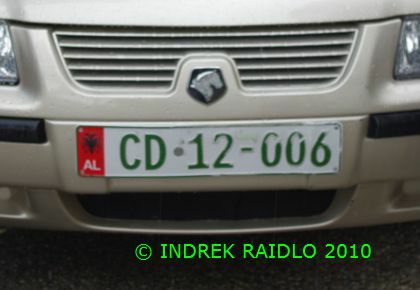 Three numerals after embassy code used from 2007 to 2011. Plate style from 2004 to 2011. 19=Poland. COMMENTS: police series from 2000 to 2009. 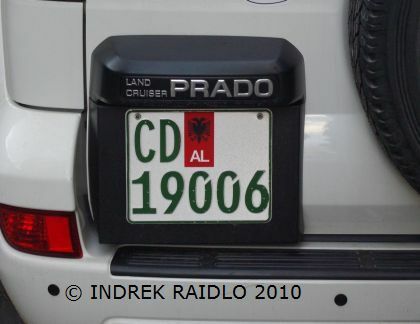 Plate style from 2000 to 2009. 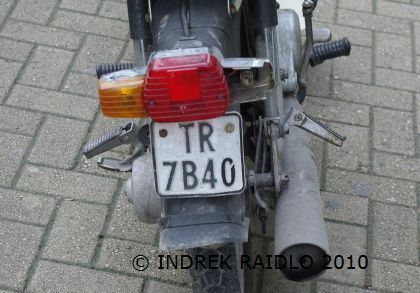 1. from 1995 to 2011 red band with national symbol used to the left or on upper row of all plate types except moped plates. 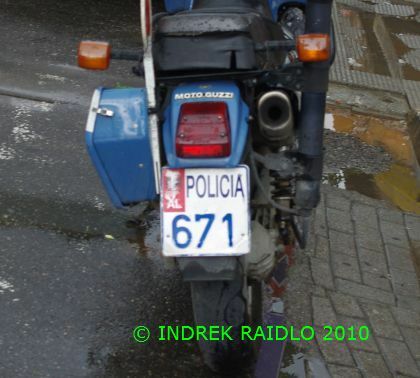 2. starting from 2011 blue band with national symbol used to the left of plates.